Attending Eastern Illinois and playing for a number of local teams, Lindberg Cadillac, St. Williams CYC Major League Champions and the Shamrocks, Jack sustained a knee injury and the next thing you know, Jack was an natural to the coaching side of the game. Many can play, some can coach, Jack could do both. Starting with Christ the King and St. Margaret of Scotland in the CYC, Jack became the head coach for the boys at St. John the Baptist. 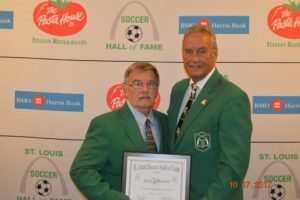 His success at St. Johns led him to the head coaching position and starting the soccer program at Fontbonne University where the team took National Champions honors in 1985 and he was selected National Coach of the Year. In 1986 Webster University was his next calling and he responded with a 15 win season in a program that had won 3 games in their prior 3 years. Next on his coaching challenges were the women at Missouri Baptist for two years and in 2000 Terry Michler (HOF 2008) asked him to be an assistant at CBC. In 2013 Jack was called upon by the St. Louis College of Pharmacy to start their first Intercollegiate Soccer program and continues today in teaching and coaching young men in this program. Son of Eddie Jamieson (HOF 1985).